Pharyngeal pouches occur most commonly in elderly patients (over 70 years) and typical symptoms include dysphagia, regurgitation, chronic cough, aspiration, and weight loss. The aetiology remains unknown but theories centre upon a structural or physiological abnormality of the cricopharyngeus. A diagnosis is easily established on barium studies. Treatment is surgical via an endoscopic or external cervical approach and should include a cricopharyngeal myotomy. Unfortunately pharyngeal pouch surgery has long been associated with significant morbidity, partly due to the surgery itself and also to the fact that the majority of patients are elderly and often have general medical problems. External approaches are associated with higher complication rates than endoscopic procedures. Recently, treatment by endoscopic stapling diverticulotomy has becoming increasingly popular as it has distinct advantages, although long term results are not yet available. The small risk of developing carcinoma within a pouch that is not excised remains a contentious issue and is an argument for long term follow up or treating the condition by external excision, particularly in younger patients. Lateral view of pharynx showing Killian's dehiscence. However it was not until 1886 that Wheeler performed the first successful excision.4 Several surgical procedures have since been described for the treatment of pharyngeal pouches. These include diverticulectomy,5 6diverticulopexy,7 8 diverticular inversion,9 10 cricopharyngeal myotomy,11and endoscopic diverticulotomy.12 13 Mosher (1917) is widely credited as being the first to use an endoscopic technique to treat pharyngeal pouches by dividing the common septum between the oesophagus and pouch.14 In his publication Mosher reported good results on four patients and in view of these results he continued with this method until the seventh patient unfortunately developed mediastinitis and died. Dohlman redescribed and modified the endoscopic technique and reported on 39 patients on whom he had used this procedure since 1935.15 He used a specially designed double lipped hypopharyngoscope inserting the upper lip into the oesophagus and the shorter lower lip into the diverticulum, coagulated the common septum with insulated forceps, and divided it using a diathermy knife and electrocautery instruments. By 1960 this series had risen to 100 cases with a recurrence rate of 7% and no associated deaths or serious complications.16 The endoscopic method has been further modified to include the use of an operating microscope,17 carbon dioxide,17-19 and potassium titanyl phosphate (KTP)20 lasers to divide the muscular septum. More recently in 1993, endoscopic stapling diverticulotomy using a linear transecting and stapling device has been introduced by Martin-Hirsch and Newbegin12 in the UK and by Collard et al 13 in Belgium. The interrelationship between gastro-oesophageal reflux and/or hiatus hernia remains unresolved.26 However an association has been reported between them27 and indeed in one study28 the incidence of hiatus hernia was more than double in patients with diverticulae compared with a control group. The histology of the pouch when excised usually shows a sac containing an epithelial lining that is stratified squamous epithelium, and the submucosa often shows fibrous tissue surrounding it.29Near to the neck of the sac scanty muscle fibres may be found in the wall. Rarely a squamous cell carcinoma or a carcinoma in situ may be present in the pouch. Typical symptoms include dysphagia (a consistent symptom), regurgitation of undigested food, choking, borborygmi in the cervical region, chronic cough, chronic aspiration due to overspill of contents from the pouch, halitosis, weight loss, and less commonly hoarseness (box 1). As the pouch enlarges symptoms generally become more severe and large diverticulae can result in malnutrition.29 The duration of symptoms at presentation may vary from weeks to several years.29 Examination findings are few and may include emaciation and rarely a swelling maybe felt in the neck which may gurgle on palpation (Boyce's sign). Pharyngeal pouches are readily diagnosed on barium studies, which should delineate the pouch well. The radiological study is incomplete if it does not include the lower oesophagus, stomach and duodenum, in order to look for any other abnormalities such as hiatus hernia or reflux oesophagitis. Contrast videofluoroscopy allows constant monitoring of the swallowing mechanism which is valuable as single shot barium swallows may miss a small diverticulum. Barium swallow studies may demonstrate a filling defect which does not move between films (as a food bolus does) and any loss of the smooth contour of the interior of the pouch should raise the suspicion of a carcinoma.35If present it is most commonly noted in the distal two thirds of the pouch but can be easily missed. The treatment of choice for an established pharyngeal pouch is surgical and the approach maybe external or endoscopic (box 2). Obviously each case should be judged on its own merit with the patient aware of the potential risks and benefits of an operation. However in some situations such as in an elderly, medically unfit patient with minimal symptoms, no treatment except careful observation maybe indicated. Endoscopic• Dohlman's (electrocoagulation). • Dohlman's (laser). • Stapling. External• Cricopharyngeal myotomy. • Diverticulectomy. • Inversion. • Diverticulopexy (suspension). As most surgeons consider an abnormality of the cricopharyngeus muscle to be the main factor in the formation of pharyngeal pouches, surgical treatments usually include a cricopharyngeal myotomy. Unfortunately pharyngeal pouch surgery has long been associated with a risk of significant complications. This is partly due to the type of surgery involved and partly to the frailty of the population operated upon. In the 1996/7 report from the National Confidential Enquiry into Perioperative Deaths on head and neck surgery the advisors were surprised by the mortality rates of 1%–2%, the majority of which were after open surgery.36 The report concluded that subspecialisation within otolaryngology departments would seem appropriate and that endoscopic surgery is a quicker, less invasive, and safe technique. Many surgical treatments have been developed for treatment of the condition but there is as yet no consensus as to the best option. Both external and endoscopic procedures are associated with risks and complications. External procedures involve an approach to the pouch via a lateral cervical approach, identifying the pouch and performing a cricopharyngeal myotomy. The pouch can itself then be treated by inversion, mobilisation, and suspension or excised and closed by a suturing technique or a stapling technique. In some cases, such as small pouches, an external cricopharyngeal myotomy on its own may be deemed adequate. The patient is usually fed via a nasogastric tube for five to seven days after which oral feeding is resumed. Endoscopic procedures involve division of the common muscular and mucosal septum that lies between the oesophagus and pouch—essentially performing an internal cricopharyngeal myotomy and creating a single lumen. Although the pouch has not been removed, it no longer fills and food passes into the oesophageal lumen with relief of symptoms. Patients can usually resume oral intake within 24 hours. Diverticulectomy has the advantage that it completely removes the pouch and technically can be used to manage all sizes of pouch, although this maybe difficult in the smallest pouches. A diverticulectomy also eliminates any theoretical risk of carcinoma which may exist in residual mucosa of a pouch that may remain after endoscopic treatment.35 However it does carry a higher complication rate including wound infections, haematoma, fistula formation, surgical emphysema, mediastinitis, and vocal cord paralysis (box 3).33 43-45 It also requires a longer anaesthetic time, making it less appropriate for the elderly or frail patient and a longer hospital stay. Inversion of a pouch is usually used to treat small to medium sized pouches. Bowdler and Stell reported a reduced mortality, complication rate, and hospital stay with inversion surgery over diverticulectomy.46 They proposed that inversion should be the treatment of choice. However they excluded patients who underwent endoscopic procedures. A more recent report concurred with this conclusion but also stated that inversion is better if pouches are not too large and not too longstanding to risk leaving subclinical carcinoma.9 In a recent review of current practice in pharyngeal pouch surgery among otolaryngologists, general surgeons and cardiothoracic surgeons,47 excision was found to be the commonest procedure performed by general surgeons but the Dohlman's procedure was popular among otolaryngologists probably because of their familiarity with rigid endoscopy. It was also mentioned that endoscopic stapling diverticulotomy was becoming increasingly popular. In comparing the treatment modalities, most series show that the endoscopic and external approaches are equally effective treatments.33 37 48-50 However there is no doubt that the external approach has a higher complication rate, including vocal cord paralysis, mediastinitis, fistula formation, glottic oedema, and stricture formation.33 43-45 However these studies were retrospective and lacked criteria for selecting patients and the procedures were performed by a large number of surgeons from several specialties. It is thus difficult to draw firm conclusions as to which is the better method of treatment, although in centres performing endoscopic diverticulotomy as a first line treatment for pharyngeal pouch, the results seem to be consistently good.37 38 41 51 However as endoscopic stapling is a relatively new technique, complications may not as yet be well reported. Assessment of treatment outcome can be made clinically. There is no role for post-operative contrast studies as they bear little correlation to symptoms and lax mucosa that remains following stapling may appear to be a residual pouch in an asymptomatic patient.52 Therefore the need for further treatment should be guided clinically by patient symptoms. Patient satisfaction studies have been used to evaluate treatment methods. Wouters and Van Overbeek reported a 99% satisfaction rate after endoscopic diathermy or laser myotomy performed on 507 patients.53 In this series there was an 8% incidence of significant complications, a 2% rate of mediastinitis and one death. In a comparison of excision and endoscopic stapling, Van Eedenet al reported improved symptoms in 88% of endoscopically treated patients and 70% of those undergoing excision with a 5% complication rate for endoscopic procedures and a 23% rate for external procedures.40 Short and long term follow ups of patients testify to a satisfactory outcome in 90% or more patients treated by endoscopic or external surgery,33 although there are at present no long term results of endoscopic stapling diverticulotomy. 1. What is the site of herniation of a pharyngeal pouch? (A) Cricopharyngeus. (B) Thyroid cartilage. (C) Middle constrictor. (D) Between the cricopharyngeus and thyropharyngeus fibres of the inferior constrictor muscle. (E) Upper oesophagus. 2. What are the possible aetiological factors in the development of a pharyngeal pouch? (A) Age (over 50 years). (C) Poor upper oesophageal sphincter pressures. (D) Hiatus herniation and oesophageal reflux. 3. What are the common symptoms that a pharyngeal pouch may present with? 4. What symptoms or signs may raise the possibility of a malignancy within a pouch? (A) Aphagia or rapidly progressing dysphagia. (B) Pain. (C) Haemoptysis. (D) Smooth contour on videofluoroscopic examination. (E) Dyspnoea. 5. Treatment of a pharyngeal pouch, if indicated, is surgical. What are the possible options? (A) Pouch excision. (B) Pouch inversion. (C) Pharyngo-oesophagectomy. (D) Endoscopic stapling (E) Endoscopic electrocautery (Dohlman's procedure). 6. Early studies have suggested a reduced complication rate with the endoscopic approach to treatment, but what are the other potential benefits of this approach? (A) Shorter anaesthetic time. (B) Reduced recurrence rate. (C) Early resumption of oral intake. (D) Various surgical specialties can perform it. (E) Shorter hospital stay. 7. Which of the following are the disadvantages of the endoscopic approach? (A) Due to neck anatomy (for example, kyphosis) access may be too limited to carry out the procedure. (B) Difficult to treat large pouches. (C) Increased risk of mediastinitis. (D) Increased risk of damage to the recurrent laryngeal nerve. (E) No specimen is sent for pathological assessment. Carcinoma and carcinoma in situ are both rare. The main predisposing factor in carcinoma developing within pharyngeal pouches is thought to be chronic inflammation of the pouch lining over many years, secondary to food retention.35 To date 45 cases of carcinoma have been reported in the English language literature.54-57The diagnosis is often made at surgery when cleaning of the pouch and careful examination with an oesophagoscope or Hopkins rod should be performed prior to any definitive surgical procedure. However cases of carcinoma in situ or small carcinomas may not be detected radiologically or by endoscopic examination. In a recent review by Bradley et al, two cases of carcinoma in situ were reported.35 Both of these had not been suspected clinically or found on endoscopy and the diagnosis was established by histopathological examination. Thus such lesions can be potentially left in pouches treated endoscopically. A further potential problem in patients treated by endoscopic surgery is that if the pouch persists despite a lack of symptoms, will it still become irritated by food bolus and are they therefore still at risk of a carcinoma? In such cases it could be argued that patients should be informed of the risk of carcinoma development in the pouch years later if it is not excised at the first presentation.35 It is for this reason that some authors propose that patients less than 65 years should undergo excision of the pouch with a long cricopharyngeal myotomy and pathological examination of the pouch.35 Long term follow up should be considered in these cases and endoscopic examination of the whole oesophagus should be undertaken if symptoms persist or recur.35 Such long term follow up of endoscopic cases will hopefully clarify the true risk of carcinoma developing in such instances. The surgical procedures used to treat pharyngeal pouches vary widely. The preferred treatment depends on individual experience and proponents of all methods report good results. Endoscopic stapling diverticulotomy is becoming increasingly popular and is the treatment of choice in many centres, although the potential risk of a subclinical carcinoma being missed in a pouch which is then not excised remains. Hence long term follow up studies which are available for all other treatment methods are necessary for endoscopic stapling as these may change our future management approach to the pharyngeal pouch. (1769) A case of obstructed deglutition from a preternatural dilatation of and bag formed in the pharynx. Medical observations and enquiries by a society of physicians in London. 2nd Ed. 3:85–101. (1877) Krankheiten des Oesophagus. in Handbuch der Speciellen Pathologie and Therapie. Vol 7 (suppl). ed von Ziemssen H (FCW Vogel, Leipzig), pp 1–87. (1908) Ueber den mund der speiserohre. Z Ohrenheilkd, Krankheiten Luftwege 55:1–41. (1886) Pharyngocoele and dilation of the pharynx, with existing diverticulum at lower portion of pharynx lying posterior to the oesophagus, cured by pharyngotomy, being the first of the kind recorded. Dublin Journal of Medical Science 82:349–356. (1974) The treatment of pharyngeal pouch. J Laryngol Otol 88:307–315. (1976) The treatment of pharyngeal pouch. J Laryngol Otol 90:183–190. (1994) Esophageal diverticulum: diverticulopexy versus diverticulectomy. Laryngoscope 104:889–892. (1993) Diverticulopexy and cricopharyngeal myotomy: treatment for the high-risk patient with a pharyngoesophageal (Zenker's) diverticulum. Otolaryngol Head Neck Surg 100:146–153. (1993) Inversion of Zenker's diverticula: the preferred option. Head Neck 15:253–256. (1992) Diverticular imbrication and myotomy for Zenker's. Laryngoscope 102:1377–1378. (1992) Treatment of Zenker's diverticula by cricopharyngeus myotomy under local anaesthesia. Am Surg 58:710–716. (1993) Autosuture GIA gun: a new application in the treatment of hypopharyngeal diverticula. J Laryngol Otol 107:723–725. (1993) Endoscopic stapling technique of esophagodiverticulostomy for Zenker's diverticulum. Ann Thorac Surg 56:573–576. (1917) Webs and pouches of the esophagus: their diagnosis and treatment. Surg Gynecol Obstet 25:175–187. (1948) Endoscopic operations for hypopharyngeal diverticula. Proceedings of the Fourth International Congress on Otolaryngology. London, pp 715–717. (1960) The endoscopic operation for hypopharyngeal diverticula. J Laryngol Otol 71:744–752. (1984) Microendoscopic surgery of the hypopharyngeal diverticulum using electrocoagulation or carbon dioxide laser. Ann Otol Rhinol Laryngol 93:34–36. (1987) New endoscope for (laser) endoscopic diverticulotomy. Ann Otol Rhinol Laryngol 96:658–660. (1993) Microendoscopic laser diverticulotomy for hypopharyngeal diverticulum. Ann Otol Rhinol Laryngol 102:675–679. (1992) Zenker's diverticulotomy using the KTP/532 laser. Laryngoscope 102:946–950. (1990) Pathogenesis and endoscopic treatment of the hypopharyngeal (Zenker's) diverticulum. Acta Gastroenterol Belg 53:323–329. (1999) The physiopathological basis for Zenker's diverticulum. Chirurg 70:741–746. (1996) Influence of surgery on deglutitive upper oesophageal sphincter mechanics in Zenker's diverticulum. Gut 38:806–811. (1992) Pharyngeal (Zenker's diverticulum) is a disorder of upper esophageal sphincter opening. Gastroenterology 103:1229–1235. (1992) Structural abnormalities of the cricopharyngeus muscle in patients with pharyngeal (Zenker's) diverticulum. J Gastroenterol Hepatol 7:556–562. (1992) Zenker's diverticulum and reflux. Hepatogastroenterology 39:100–104. (1994) Pharyngeal pouch: link with reflux and oesophageal dysmotility. Clin Otolaryngol 19:241–242. (1988) Incidence of Zenker's diverticulum with hiatus hernia. Laryngoscope 98:527–530. (1997) Pharyngeal pouches. In Kerr A, ed. Scott Brown's textbook of otorhinolaryngology. (Butterworth-Heinmann, Oxford), 6th Ed. pp 1–21. (1992) An unusual pharyngeal pouch. J Laryngol Otol 106:1002–1003. (1984) Handedness and the side on which pharyngeal pouches occur. BMJ 288:815–816. (1994) Zenker's diverticulum. Current Opinion in Otolaryngology, Head and Neck Surgery 2:55–58. (1995) Surgery for pharyngeal pouch: audit of management with short and long-term follow-up. J R Coll Surg Edinb 40:315–318. (1986) Pharyngeal diverticula. Clin Otolaryngol 11:219–225. (1999) Pharyngeal pouch carcinoma: real or imaginary risks? Ann Otol Rhinol Laryngol 108:1027–1032. (1996/7) Pharyngeal pouch surgery. The report of the National Confidential Enquiry into Perioperative Deaths. (Royal College of Surgeons of England, London) , 32..
(1994) Meditation on the pathogenesis of hypopharyngeal (Zenker's) diverticulum and a report of endoscopic treatment in 545 patients. Ann Otol Rhinol Laryngol 103:178–185. (1996) Endoscopic stapling diverticulotomy for pharyngeal pouch. Clin Otolaryngol 21:371–376. (1998) Long-term experience with endoscopic-staple assisted esophagodiverticulostomy for Zenker's diverticulum. Laryngoscope 108:200–205. (1999) Comparison of the endoscopic stapling technique with more established procedures for pharyngeal pouches: results and patient satisfaction survey. J Laryngol Otol 113:237–240. (1998) Endoscopic stapled diverticulotomy: a real advance in the treatment of hypopharyngeal diverticulum. Clin Otolaryngol 23:244–247. (1998) The role of endoscopic stapling diverticulotomy in recurrent pharyngeal pouch. J Laryngol Otol 112:954–955. (1999) Surgical treatment of Zenker's diverticulum: transcutaneous diverticulectomy versus microendoscopic myotomy of the cricopharyngeal muscle with CO2 laser. 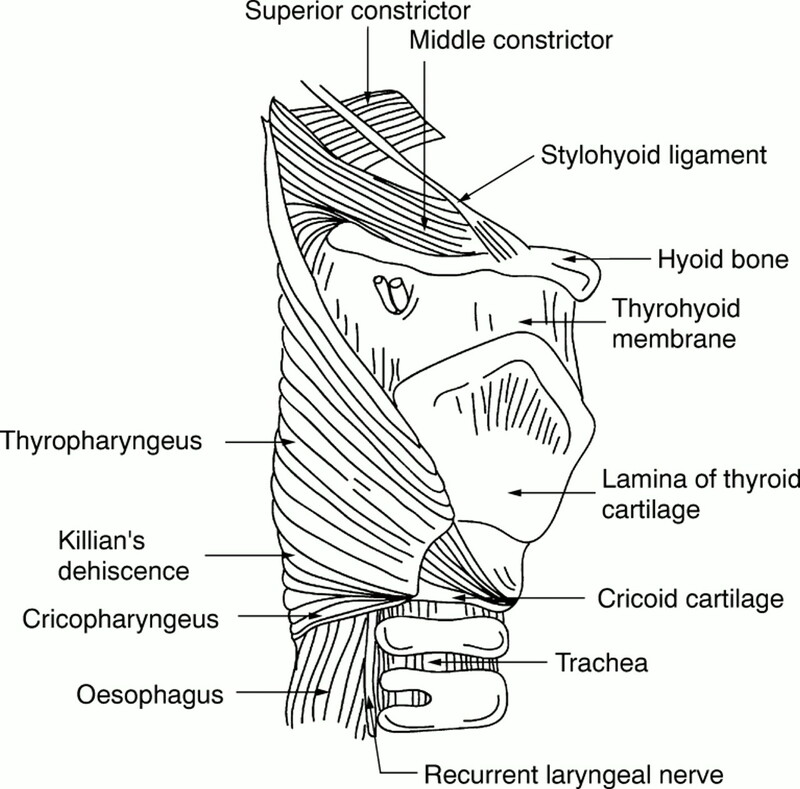 Otolaryngol Head Neck Surg 121:482–487. (1999) Zenker's diverticulum: analysis of surgical complications from diverticulectomy and cricopharyngeal myotomy. Laryngoscope 109:858–861. (1990) Surgical treatment of Zenker's diverticulum. J Larynol Otol 104:312–314. (1987) Surgical management of posterior pulsion pharyngeal diverticula: inversion versus one-stage excision. Br J Surg 74:988–990. (1997) Current practice in pharyngeal pouch surgery in England and Wales. Ann R Coll Surg Engl 79:190–194. (1997) Microendoscopic treatment of the hypopharyngeal diverticulum with the CO2 laser. Lasers Surg Med 20:394–301. (1997) Surgical outcome in 87 patients with Zenker's diverticulum. Laryngoscope 107:720–725. (1992) The treatment of pharyngoesophageal diverticulum: the simple and complex. Hepatogastroenterology 39:109–114. (1991) Endoscopic diverticulotomy for the treatment of Zenker's diverticulum. Otolayngol Head Neck Surg 104:448–452. (1999) Pharyngeal pouch endoscopic stapling-are post-operative barium swallow radiographs of any value? J Laryngol Otol 113:233–236. (1992) Endoscopic treatment of the hypopharyngeal ( Zenker's) diverticulum. Hepatogastroenterology 39:105–108. (1987) Carcinoma arising in posterior pharyngeal pulsion diverticulum (Zenker's diverticulum). Br J Surg 74:561–563. (1989) Carcinoma of the pharyngeal pouch. J Laryngol Otol 103:695–697. (1990) Pharyngeal pouch carcinoma: two unusual cases. J Laryngol Otol 104:821–823. (1994) Carcinoma in a long-standing Zenker's diverticulum. Rev Esp Enferm Dig 85:203–207. 1. (A) F, (B) F, (C) F, (D) T, (E) F; 2. (A) F, (B) F, (C) T, (D) T, (E) T. 3. (A) T, (B) F, (C) F, (D) T, (E) T; 4. (A) T, (B) T, (C) T, (D) F, (E) F; 5. (A) T, (B) T, (C) F, (D) T, (E) T; 6. (A) T, (B) F, (C) T, (D) F, (E) T; 7. (A) T, (B) F, (C) F, (D) F, (E) T.